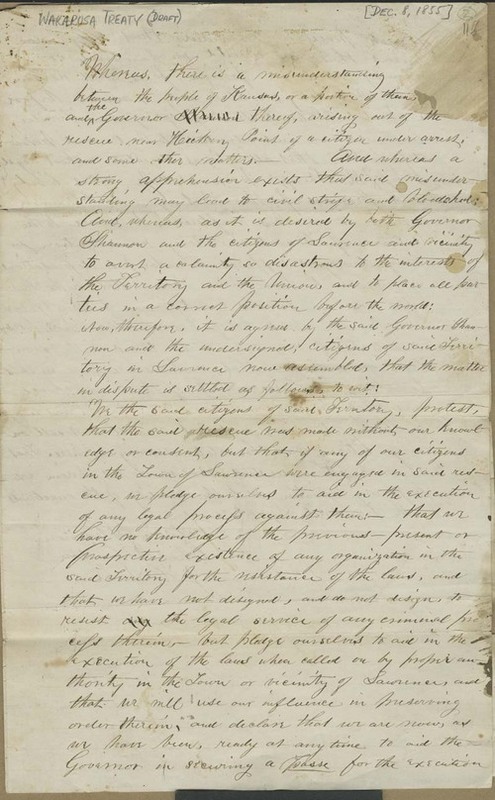 A draft of an agreement between Governor Wilson Shannon, representing the territorial government, and Charles Robinson and James Lane, representing the free state movement, settling the dispute that resulted in the Wakarusa War. In essence, Robinson and Lane pledged to "aid in the execution of any legal process" against individuals involved in rescuing free state supporter Jacob Branson provided that these individuals received a hearing before a U.S. District Court judge. This compromise ended the Wakarusa War. Collections - Manuscript - Blackman, William I. R.